Tofu is NOT something I normally like. In fact, normally, I avoid it. I know- it’s a great source of protein and a staple for vegetarians, but it is not part of my usual diet. Until now… Maybe it’s been around for awhile, but I recently discovered smoked tofu, and curiosity led me to try it. Although the the tofu texture was still not my favourite, I cut it up quite small and I barely noticed it. The smokiness of the tofu infused the whole sauce making for a rich and filling pasta dish that was delicious and healthy. Smoked tofu might become a staple in my house…. In a wok, over medium-high heat, heat olive oil and sauté onion, garlic and smoked toft until onion is soft. Add red pepper and cook for a few more minutes stirring frequently. Add coconut milk, bouillon and sun dried tomatoes and allow to simmer for 10 minutes. Meanwhile, in a large pot, cook pasta of your choice in salted water. Add spinach to the sauce, and cook until spinach is just beginning to get soft. Salt and pepper to taste. Using a ladle, spoon sauce over pasta. Top with fresh basil. 5 weight watchers points plus per serving of sauce. This is one of my favourite recipes to use all the veggies that need to get eaten from the fridge. I have included everything from portabella mushrooms to kale. The staple veggies I always use are onion, peppers and sweet potato. I make it a little bit different each time, this is my latest version. 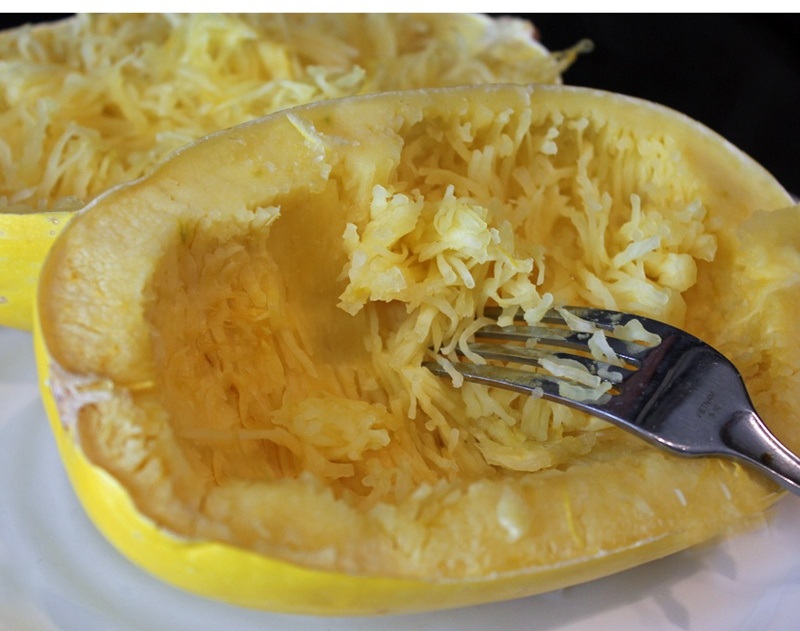 Cut spaghetti squash in half lengthwise and scrape out seeds and pulp. Place face down in a shallow dish with a small amount of water. Cook on high in the microwave for 8-10 minutes. Alternatively, heat oven to 375 F and cook squash for 40-45 minutes. After cooking, allow to cool. Over medium heat, in a large frying pan or wok, heat oil. Cook onions and garlic for 2-3 minutes. Add sweet potato and cook for about 5 minute stirring frequently. Adding peppers, zucchini and tomato, continue sautéing for 4-5 minutes. While sauce is simmering, using 2 forks, scrape the spaghetti squash loose. Keep half of the squash in the skin and transfer half to a bowl. Turn heat to low and stir in bocconcini, covering with sauce completely. Allow sauce to sit for an additional 5 minutes so that the cheese can begin to melt. 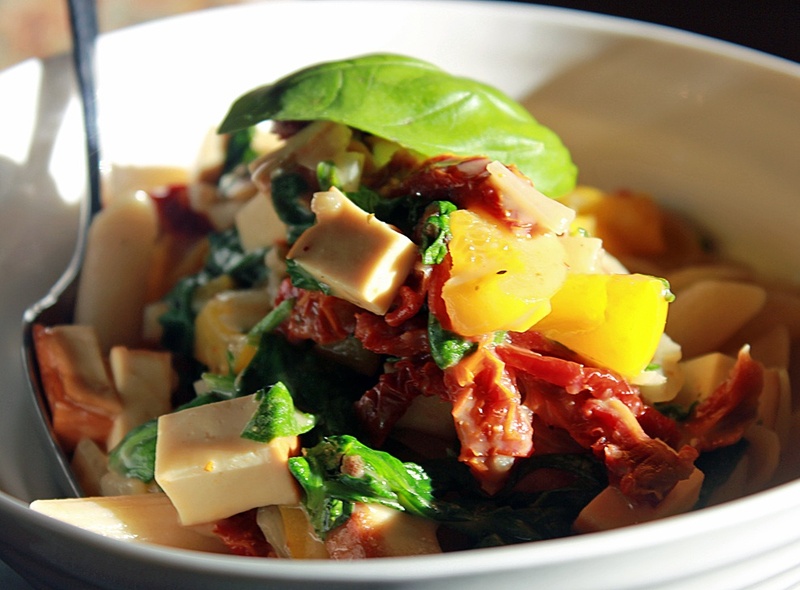 Do not stir, as bocconcini cheese pieces are meant to stay mostly intact. 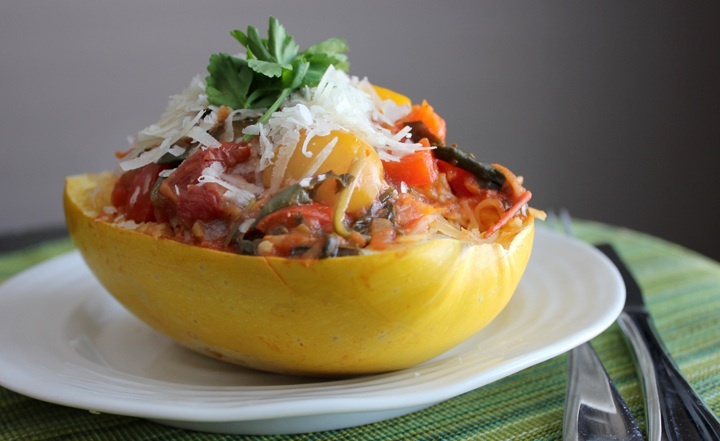 Scoop sauce directly into spaghetti squash ‘bowls’, layering sauce and remaining squash. Top with Parmesan cheese and fresh parsley.